Peanut butter and jelly. Spaghetti and meatballs. Chromebooks and education. It’s a perfect match. Students are using technology more regularly and meaningfully in classrooms, and Chromebooks’ popularity and use in education are on the rise. The explanation for their increasing market share is clear: Chromebooks are simply less expensive, easier to deploy, and more effective for learning in many classrooms than the competition. 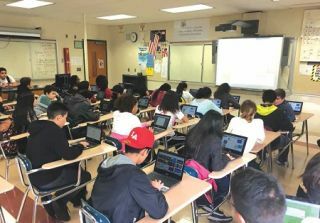 Ossining High School use their Chromebooks for a variety of assignments. Still, it’s not just about the technology—it’s about what you do with it. Without purpose and thought, a Chromebook is no more than an expensive paperweight. But when the Chromebook is used to support, enhance, and transform learning, it can be a game changer in education. Of course, there are challenges to managing students’ use of any technology in the classroom and the Chromebook is no exception. However, when teachers take advantage of all the device has to offer and its integration with Google Apps for Education, the Chromebook truly is the one device to rule them all. The Google Apps integration on the Chromebook is one of its most powerful features. For a student to be able to log in once, with one account, and have access to all of Google Apps’ important resources for learning is essential for technology integration and classroom management. For all students, from the youngest to the oldest, the same account and password is the key to unlocking Chromebook’s magic. With its quick and easy boot-up and log-in, teachers can maximize instructional time without worrying about the device. Google Chrome’s bookmark bar is another tool that’s valuable for making classes as efficient as possible. Teachers can model effective bookmark organization and show students how to save all frequently used sites. Once students know how to sign in to their accounts and link their data when using other devices, they will have everything they need for learning all the time. While these steps might save only a few clicks, a few clicks from each student every period turns into minutes every day and week that can be better used for student learning. The same concept applies to Google Chrome extensions and apps pinned to the shelf on a Chromebook. Learn how to customize the device and allow students the same freedom to establish ownership of their online learning. Make creating profile images, customizing backgrounds, and pinning favorite apps part of the routine. This individualization empowers students to become more active participants in their online learning and makes the Chromebook an authentic part of their education. Keeping Chromebooks neatly stored and charged is key. If students have a device in their hands, the potential for learning is endless. Gone are the days when a student who finished early had to wait for the class to catch up and the one who needed a little more time fell behind. With Chromebooks and technology, students can work at different paces because they’re always just a click away from much more to do, try, or achieve. Students’ learning is no longer restricted to the class period or even to classroom walls, and students can continue making progress outside of class, in extra help, or at home. Since they can have access to online tools and learning resources, providing extended time, revision opportunities, or extensions of learning is easy, and students’ growth is never limited. These advantages aren’t unique to the Chromebook, but the flawless integration of Google Apps makes all this possible with ease and efficiency. One of the best ways to make sure that class time using Chromebooks is focused on student growth and achievement is to have a consistent home for online learning. Whether that’s a class Web site, Google Classroom, part of your LMS, or something else, it should always help students figure out what to do next. It’s a huge help in classroom management and student achievement, too. When a student is distracted, point him back to this location. Date and number your assignments so they’re logical and linear, and encourage students to revisit tasks and review past lessons so that their learning is formative and recursive. Many students know how to use technology, but that doesn’t mean they know how to use it for their education. Don’t forget to teach not just technology skills, but also the classroom application that’s important to your goals. Management, routines, and procedures are essential for success in teaching any subject, and even more so with technology. The potential for distraction, the need for support, and shifts in teaching and learning all come with this greater potential for learning. Figure out how you want things done in your classroom and hold students to high expectations. Consider device storage and charging needs, if those apply to your classroom. If devices are stored in your room, build in time and procedures for taking them out and putting them away. Chromebooks and Google Apps are great for sharing and collaborating, so encourage students to support each other as they become acquainted with the devices and learn how to use them to enhance their education. In the end, a device is just a tool to meet the learning needs of students. Most of what can be achieved on a Chromebook is also possible with other devices, but the Chromebook’s speed, ease of use, and full Google Apps integration make it a clear winner for the classroom. Manage the use of Chromebooks with clear procedures, allow students freedom to explore and grow in their learning, and embrace the efficiency of the single log-in to maximize Chromebooks’ potential and transform teaching and learning for your students. Adam Schoenbart is an English teacher and technology coach at Ossining High School in Ossining, NY. 1 The AVerCharge C30i’s sleek, compact design provides storage for 30 Chromebooks, laptops, or tablets with up to a 15” screen. 3 devices in a single bay. 4 Copernicus Tech Tubs hold 24 Chromebooks, iPads, and other tablets; schools can add more Tech Tubs and Carts as needed. 5 Ergotron’s Zip40 Charging Cart has up to 40-unit capacity, with 1.1”-wide slots and partial shelf for extra storage—ideal for tablets, Chromebooks, and Ultrabooks. 6 HamiltonBuhl’s PowerStacker Tower with modular components can be combined into multiple configurations to hold from 10 to up to 40 devices. 7 The compact LocknCharge Carrier 20 Cart can store and simultaneously charge as many as 20 mobile devices at once. 8 The PowerGistics 12 Shelf Wall Mount Charging Station provides a small footprint and an open concept so each stored device can quickly and easily be inventoried and cataloged. 9 Thread by Steelcase is a simple power distribution system that turns any carpeted floor into a power source by running power through ultra-thin tracks. 10 Tripp Lite Charging Stations charge, secure, and organize up to 48 USB or 32 AC devices, such as tablets and Chromebooks.